1. From Marine Interstitial Fluids to Paleosols - A Review (G.V. 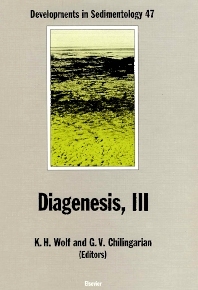 Chilingarian, K.H. Wolf). 2. Early Diagenesis and Marine Pore Water (C.H. van der Weijden). Introduction. Part I: Early diagenetic processes. Organic carbon, diagenesis and related impact on pore-water chemistry. Oxygen consumption. Nitrate consumption (denitrification). Manganese and iron oxide reduction. Sulphate reduction. Methane production. Production of carbon dioxide and alkalinity. Production of dissolved phosphate and silica. Part II: Diagenetic equations. Introductory remarks. Porosity. Concentrations. Steady state. Advection. Diffusion. Coupled fluxes and ion-pairs. Enhanced mass transport across the sediment - water interface. The reaction term: production or consumption. Part III: Examples of modeling of early diagenetic processes. General oxidant consumption and redox potential. O2 consumption. Nitrification and denitrification. Manganese oxide reduction. Sulphate reduction. Methane production. Production of carbon dioxide and alkalinity. Production of dissolved phosphate and silica. Acknowledgements. List of symbols. References. 3. The Recognition of Soft-Sediment Deformation as Early-Diagenetic Features - A Literature Review (A.J. van Loon). Introduction. Studies on early-diagenetic deformations. The period before 1950. The early age of sedimentology. The 1960-1970 period: emphasis on environmental analysis. 1970-1980: basin analysis and palaeogeographic reconstructions. The post-1980 period. Acknowledgements. References. 4. Climate Influence on Diagenesis of Fluvial Sandstones (P.K. Dutta). Introduction. Climate control on ground water chemistry and soil mineralogy. Climate control on detrital mineralogy of fluvial sand. Climate control on early diagenesis. Early diagenetic mineral assemblage and climate. Climate control on deep burial diagenesis. Conclusions. Acknowledgements. References. 5. Diagenesis of Deep-Sea Volcaniclastic Sandstones (Y.I. Lee). Introduction. Distribution of deep-sea sandstones and tectonic setting. Diagenesis of back-arc basin sandstones. Diagenesis of fore-arc basin sandstones. Comparison between back-arc and fore-arc basin sandstone diagenesis. Conclusions. References. 6. A Volume and Mass Approach to Carbonate Diagenesis: The Role of Compaction and Cementation (W. Ricken). Introduction. Some basic considerations of compaction in calcareous rocks. Application of the carbonate compaction equation. Conclusions. Acknowledgements. References.7. Diagenetic History of the Aymestry Limestone Beds (High Gorstian Stage), Ludlow Series, Welsh Borderland, U.K. (A.H. Mohamad, E.V. Tucker). Introduction. Stratigraphic framework. Lithological characteristics. Petrography. Microfacies. Diagenesis. Petrography of the cements in Aymestry Limestone. Cement assemblages. Incipient dolomitization. Cementation sequence: summary. Post-diagenetic fabric in very fine-grained clastics. Silification. Acknowledgements. References. 8. Geochemical and Isotopic Constraints on Silica and Carbonate Diagenesis in the Miocene Monterey Formation, Santa Maria and Ventura Basins, California (R.W. Hurst). Introduction. Paleoceanography. Depositional history. Miocene climatic and tectonic events. Monterey Formation lithofacies. Siliceous sediment diagenesis in the Monterey Formation. Secondary carbonates in the Monterey Formation. Experimental and oceanographic observations. Geochemistry of Monterey Formation carbonates and siliceous sediments. Response of the Rb/Sr system to diagenesis. Acknowledgements. References. 9. Maturation of Organic Matter as Revealed by Microscopic Methods: Applications and Limitations of Vitrinite Reflectance, and Continuous Spectral and Pulsed Laser Fluorescence Spectroscopy (P.K. Mukhopadhyay). Introduction. Vitrinite reflectance. Other maturation parameters. Fluorescence microscopy. Continuous spectral fluorescence. Pulsed laser fluorescence. Correlation of maturation parameters. Summary and conclusions. Acknowledgements. Appendix A: Glossary. Appendix B: Fluorescence colors of various macerals at two maturation stages. References. 10. Diagenesis and Its Relation to Mineralization and Hydrocarbon Reservoir Development: Gulf Coast and North Sea Basins (M.P.R. Light, H.H. Posey). Introduction. Deep fluid sources in basinal settings. Long-duration diapiric uplifts. Short-duration diapiric uplifts. Porosity preservation. Diagenetic reactions in the Gulf Coast and North Sea basins. Integrated hydrothermal model. Application of an integrated model to a North Sea cap rock. Identification of hydrocarbons on halokinetically formed traps. Conclusions. Acknowledgements. References. 11. Precambrian Iron-Formations: Nature, Origin, and Mineralogic Evolution from Sedimentation to Metamorphism (H.L. James). Introduction. Background review. Origin of iron-formation. Sources of iron and silica. Mineralogic evolution of iron-formation. Epilogue. References. 12. Paleosol Recognition: A Guide to Early Diagenesis in Terrestrial Settings (V.P. Wright). Introduction. Paleosols. Paleopedogenesis - the norm or the exception. Criteria for recognizing paleosols. Paleosol diagenesis. Shallow phreatic diagenesis. Conclusions. Acknowledgements. References. 13. Silica-Cemented Paleosols (Ganisters) in the Pennsylvanian Waddens Cove Formation, Nova Scotia, Canada (M.R. Gibling, B.R. Rust). Introduction. Geological setting. Ganisters. Ganister petrography and geochemistry. Origin of ganister-bearing paleosols. Conclusions. Acknowledgements. References. Subject Index. Erratum.